Like its kitchen cupboard companion, dried pasta, risotto rice should be viewed as a blank canvas upon which build to build striking layers that will excite the tastebuds. 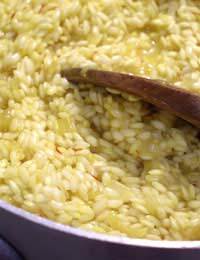 A previous section dealt with the procedure and ingredients to produce a basic risotto. The following suggestions unless otherwise indicated build on that template of soffritto, stock and rice, finished off with parmesan and butter, and use Arborio or Carnaroli grains. Let's start with an example of how just one extra, but extra special, ingredient can pay big dividends. The northern town of Treviso in the Veneto region, around 30 kilometres from Venice, is famous for its late harvested purple and white radicchio, a member of the chicory family, known as tardivo di Treviso. The leafs are renowned for their sweetness, making them an ideal counterbalance to the more salty input of stock and parmesan. The radicchio leaves should be roughly chopped and added at the soffritto stage so that they soften slightly before the stock begins to be added. The Veneto also claims ownership of risi e bisi, or rice and peas, which is a looser risotto that utilises the semifino Vialone Nano grain. Here the soffritto is combined with about 125 grams of freshly podded or frozen peas cooked in a couple of ladles of broth, then liquidised. Wipe the skillet clean, add a little more oil or butter and add the rice which should be coated with the fat before the process of adding the stock begins. Midway through the cooking process add another 125 grams of peas together with the pureed peas. When the autumnal air begins to make its presence felt in the city of Turin and the surrounding Piemontese countryside, it is often accompanied by the aromas of risotto combined with porcini mushrooms. Fresh porcini are highly prized for their meaty texture but can be difficult to source. However, the dried variety, which are widely available in supermarkets and specialist Italian delicatessens, make an adequate substitute. They should be reconstituted, chopped and added after the raw rice has been coated in the fat. The liquid used for reconstituting the mushrooms should be strained to remove impurities and particles of soil, then added halfway through the cooking of the risotto to give the dish a deeper flavour of the forest floor. Risotto al Barolo is another classic of the cooking of Piemonte. Barolo is a much celebrated red wine of the region, made from Nebbiolo grapes. It is added to the process of a basic risotto near the end of the cooking process in order that the alcohol content burns off, leaving only the distinctive characteristics of the wine to make their presence felt. Moving north-east from Piemonte, no discussions of signature risotto recipes would be complete without a mention for alla Milanese, which takes its name from the capital of the Lombardy region where it was made famous. The finished rice is distinctive for the gold colour derived from the addition of a few strands of saffron, and is traditionally served as an accompaniment to veal shank, or osso bucco.